Actually my initial plan was to modernize a P6M or even P7M for the job, but they felt too large to really fit the littoral requirement, so I went back to one of my own older designs. 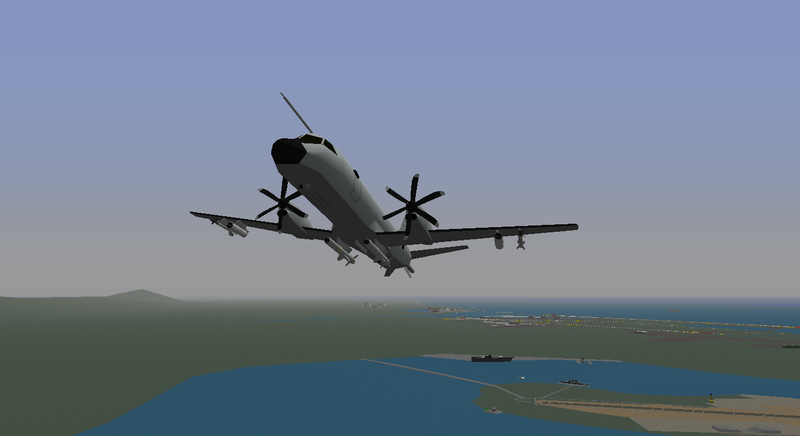 Introducing the P-4A Leviathan for consideration of the NATO Littoral MPA contract. The P-4A Leviathan hunts the Littoral waters of the world with deadly ease and flexibility. Capable of operating from short runways (<2500ft) at MTOW, the P-4A carries up to 5000lb of weapons while retaining a modest self defense capability with 2 AIM-9M Sidewinder missiles. Shown with an optional MAD boom, Wing-tip sensor pods, and dorsal-mounted Multi-Spectral Targeting System and powerful spot lights, this airframe can be tailored to the specific requirements of any nation while still retaining commonality with other operators. One aircraft is capable of supporting a wide range of missions including ASW, ASuW, and ISR while keeping costs down by leveraging Off-The-Shelf technology and systems. This model is a Beta Competition aircraft and may not be modified until released as a competition pack or independently on my website. When released, repainting and modifications may be made as long as credit is given to myself for the original model. CEP for the baseline DAT file. The SAAB P-6A Nemesis, ready for preliminary roll out! 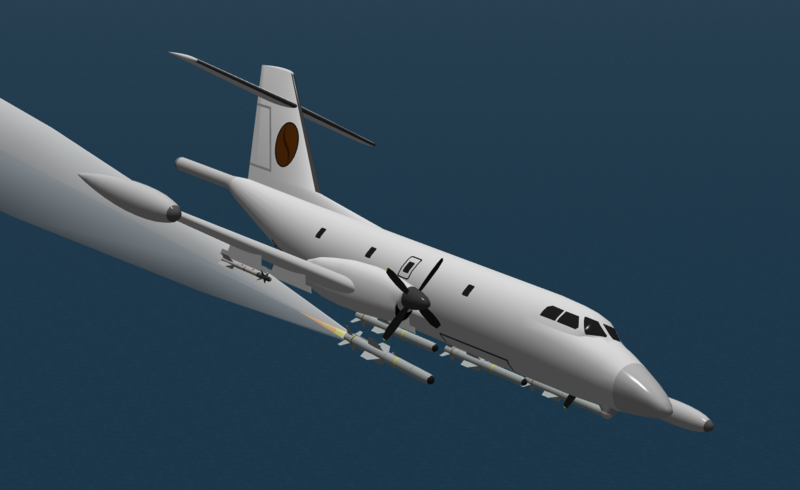 The P-6 is an extensive militarization of the SAAB 340 regional airliner by way of the S 100 Argus AEW&C aircraft designed for the maritime patrol mission. Using a variety of proven components lifted from US Navy service - the radar and MAD equipment from an S-3B, and EOS from the A-6 intruder, it's about as off the shelf as they come. In order to improve range and provide additional space for mission essential systems, the aircraft's about 2.5 meters longer, with plugs for and aft of the main wing. Heavy stores are housed where the wing meets the body to minimize the need for major strengthening. The PW124B turboprops add around 1/4 more thrust, restoring some of the performance lost from weight gain, and giving a nice boost in cruise speed for a modest hit to fuel economy. The wings themselves were subject to as little modification as possible - major structural impacts are relatively modest to keep development costs down. As a practical result, takeoff performance with full load does suffer, and while the aircraft is widely deployable to small commercial airports, it is not a STOL type. The load of 5 mk46 torpedoes gives the aircraft good persistence in the ASW role, while a pair of Harpoons or RBS-15's offer a useful if not terribly impressive capability against large surface combatants. The sensor turret, derived from the A-6 TRAM system, provides some degree of night time optical tracking capability while providing robust support for laser guided munitions. Maverick integration is intended, but not completed at the time of initial deployment, with Hellfire integration is being considered as a possible counter to small boats. The P-6 is designed to be a fully functional sub hunter, and has a few novel features to support that role. The first is numerous view ports all over the aircraft, largely making up from the mediocre side and rear quarter visibility inherent to most non-tactical types. The second is a novel gun system, firing what are essentially blanks over a fairly broad area below and beside the aircraft. What this system is meant to do is to highlight the locations of objects which are not water over areas of a map that are designated water without damaging them. This should be useful for locating some player controlled submarines on paved over water maps. The guns fire directly down, and will not hurt ground objects or other planes. There is a view port located to observe the results of the gun broom. The use of a gun turret based sensor in the model of the Oranleed Defiant or Mosquito is under consideration, but is not currently implemented. This isn't the prettiest airplane in the competition by any stretch, and I had some help with panel lines from Copperhead. 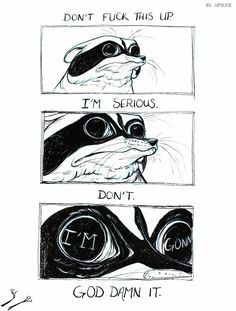 (He did all the work). The torps and Harpoons are the same as Decaff used, but the empty gun srf was all me. Primary credit for the base model goes to Masa-AT, that magnificent source of low poly models that are about the right shape if you don't look to close. The propellers have been sitting in my mod folders for ages as part of a turboprop fighter idea, of all things. I think I got them from a nice gac C-2 Greyhound, possibly from Monoceros? If I'm wrong, feel free to correct me. There's a fun little sales flier packaged with the plane, so enjoy that too. The Mule SC-11 comes from an extensive family of both land and carrier based aircraft dating back to the original mule C-1 and A-2 from the early 1960's. With many family traits, the Mule is known to be a versatile, tough, reliable, aggressive and powerful medium/lightweight cargo/combat aircraft, all of this gives it a unique approach as an MPA. While the Mule SC-11 has now taken on the roll of an MPA and almost all of the capabilities that come along with that roll, it still maintain's many features of it's cousins, such as a hefty weapons payload, impressive STOL performance and fairly high speed with decent agility. So in a nutshell, Mule SC-11 is capable of long range MPA work, but it can certainly be tactical when need be. Though carrier capability remains optional to buyers, it is fully capable in that respect as the Mule SC-11 maintains sturdy gear and a tail hook as well as folding wings and a retractable MAD boom for storage below deck or in small hangars. For sub hunting, the aircraft is equipped with the same radar/sonar system as used on Oranleed's Mosquito NF MK.II, it's also worth mentoning that the aircraft has 4 views in total, 2 in the cockpit for pilot and co-pilot with the other 2 below in a camera, one facing fowards and the other pointed down at 245 degrees for scanning with the blank gun array. I'd also like to give a special thanks to Bombcat and all of the other good folks who helped me along the way, always a pleasure to work together. All of the aircraft are beautiful models and designs however with this being an aircraft design contest aesthetics aren't important. The aircraft submitted all have their advantages and quirks. The Handley Page Pheonix is more of a maritime patrol bomber than an anti-submarine aircraft considering the fact that it is too large for the littoral role specified and doesn't carry ASW systems it can't be considered for the competition. Whilst this is the case as a maritime patrol bomber it is very good and could easily find a home in such a role. 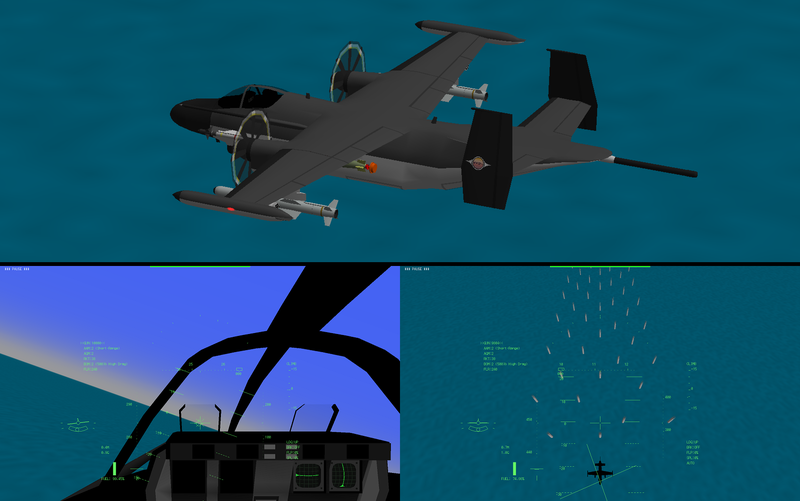 The Viper Virtual Design's Mule SC-11 is an interesting aircraft aimed more at the lowest end of the requirements. Whilst the aircraft is very good in both ASuW and the secondary ground attack role. The aircraft falls down due to only having two systems operators which for ASW would lead to a workload unmanageable by the crew. However, the aircraft is recommended to customers seeking an aircraft which can fulfill the ASuW and COIN roles. The P-4A Leviathan is considered to be a very capable aircraft for the role that has been specified. The aircraft fulfills the roles to which the contest requires brilliantly. The aircraft is however considered a costly proposition requiring much more development than the Mule or the P-6. Whilst a high-risk aircraft there is nothing stopping it becoming a truly great MPA and may also be an attractive option to nations which can't afford to operate the larger MPAs such as Nimrod or P-7. As mentioned above all of the aircraft look the part and could fill niches for different operators. We were impressed by the entrants and therefore coming to a conclusion has been much harder than initially anticipated. We would like to express our gratitude to the entrants due to their highly detailed and developed designs which has manifested itself in some very hard decisions for the committee. We would also like to announce that more YSFlight Design contests are forthcoming and that we would like to invite the entrants with their great design capabilities and others to enter as we feel that this contest has helped to show what great knowledge in aircraft design we have in this community. A pack containing the four entrants will be released very soon. This was a ton of fun. Congrats Bombcat! I'd especially like to thank Decaff and Cppperhead, who were always more collaborators than competitors throughout the process. Zak, thank you for bringing quality modding work and a very differemt perspective to the contest. Thanks to Welshy and Animal for bringing his sort of contest back to the YS community. It's been a fun way to enjoy the game. 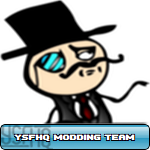 I hope to see even more creativity from both our contest hosts and our modding community. Thanks everyone!